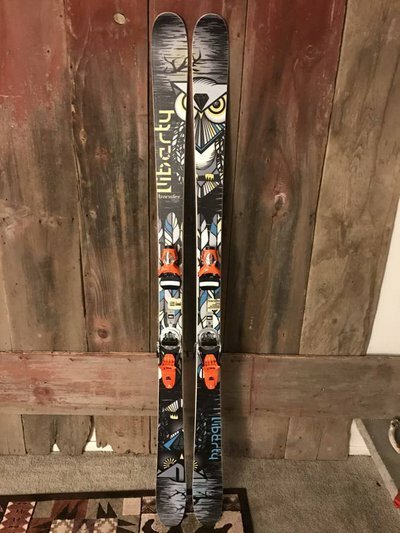 Barely used Liberty Transfer skis. I have used them about ten times. They are in great shape and a good ski made here in Colorado. I am only selling them because they are my second pair of skis and I don't get enough time ride them. Transfer gaps are now well within your bag of tricks with the Liberty Transfer Skis. Full camber provides you with the absolute best construction in the industry for loading up the ski and popping for huge air. The bamboo laminates of the Transfer give you tons of energy, further increasing the pop factor, while the Poplar counterpart is damp, for impact absorption and stability at speed. The Transfer also features ABS sidewalls, a P-Tex 2000 base and HRC 40 edges, premium materials that increase the durability and life of your skis. For the absolute best in the terrain park, look no further than the Liberty Transfer Skis. The mounted bindings are Rossignol 180 FKS. The most trusted binding in alpine skiing is back. The Rossignol FKS 180 Ski Bindings feature bombproof construction and deliver better retention and prevention of pre-release than any binding on the market. FKS bindings feature 7-points of boot contact giving superior control, response and snow feel. Skiers have less concern with pre-release due to the longest elastic travel on the market. The heelpiece rotates with the boot directly under the tibia to give more consistent, reliable and manageable release. The all-metal reinforced Pivot toepiece has 180 degree multi-directional release with high vertical and lateral elastic travel to provide shock absorption, further reducing inadvertent release. Using the shortest mounting zone available, the FKS allows deeper, rounder, more consistent ski flexing, turning, floating and smearing. The Rossignol FKS 180 Ski Bindings come in multiple brake sizes to accommodate your needs and provide the most reliable, durable and performance-oriented construction available for aggressive freeskiers. $375 + shipping is more appropriate.